I'm getting ready to take a week off for spring break. But before I go, I'll share one more food adventure. And this one isn't an April Fool's story. Outlaw has also opened a new restaurant on U.S. 74 in Monroe. That one is a full-size, sit-down restaurant and it's easier to spot: Look for the smoking pig cooker parked by the highway. Outlaw's original spot in Matthews is take-out only, although there are picnic tables outside where you can perch. 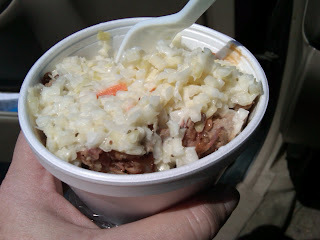 Since I was on the road, I grabbed the Barbecue Sundae to go: A small plastic cup with baking beans on the bottom, topped with shredded pork and finished off with a layer of coleslaw. They also give you two little containers of barbecue sauce. But in true Carolina 'cue fashion, their softly cooked, lightly smoked pork doesn't really need it. A cup is $5, and it makes a great lunch for eating in your car on the way to research cupcakes. Cheers! And if you're on the road this week, I hope you find food half this fun. Sounds interesting! The name 'barbecue sundae' wasn't exactly appetizing for me, but the way you describe it makes it quite interesting. Its really perfect when you're in a hurry and you can't pass a barbecue craving. Kathleen, that's great for eating at work. Like, you don't have to order food and you can carry some delicious meal in your pocket (or in your bag). You know where they do something like this. In Argentina, they eat meal every day. Is the usual food. I have stayed in some Argentina Apartments that had grills for barbeques. Was just amazing.